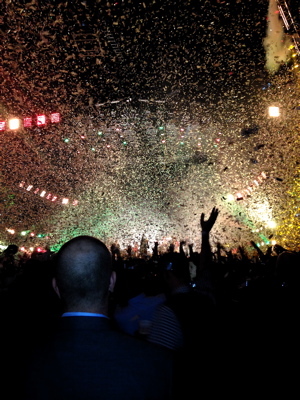 Glitter and confetti filled the air at the Arcade Fire show in Louisville. Indie-rock darlings the Arcade Fire put on a monster show March 6 at KFC Yum! to kick off their first arena tour in support of Reflektor. I was pumped to see what kind of trip these cats from Montreal Quebec would lay down. I saw them in 2011 at Jazz Fest in New Orleans and was impressed, but the festival format only allows for so much of any band’s personality to be expressed. With this in mind I was all about seeing a dedicated show from these thought provoking artists. The band requested that concertgoers not wear jeans, particularly anyone purchasing seats in the open floor section, recommending instead a mix of imagination, fashion, and costumes to ignite the crowd. This could have come off as pretentious, but it added to the evening’s allure by challenging the audience, and they responded. Kentucky doesn’t get many large alternative rock shows. Even though Louisville is home to My Morning Jacket and the Forecastle festival, most of the bigger alternative touring acts skip this area and hit Nashville, Indianapolis, Columbus, or Cincinnati, where they can guarantee a crowd. For an arena show Louisville showed up big, filling the floor and lower bowl of the arena, with attendance around 11,000, but more importantly they came dressed to play, wearing full animal suits, tuxedos, vintage wear and suits. Everyone who found their way to this show realized it was a unique event and were juiced for the performance. Fellow Canadian, DJ Kid Koala, opened the night’s festivities, coming out on the remote stage, located mirror opposite the main stage, towards the rear of the floor. As smoke filled the fake trees and cammouflage netting, out walked the former member of Wolfmother, dressed in a full Koala bear suit, ears and all. The guy spun a sweet set off a three-turntable deck, showing some serious hand-eye coordination and manual dexterity, shaming all these guys who only use laptops. 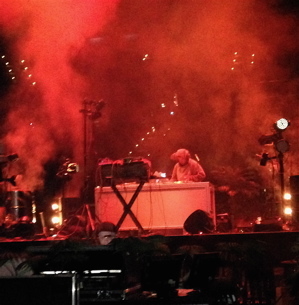 He was followed by noise provocateur Dan Deacon. I was hoping for more from Dan, but Maia and I hit one of the lounges off the main floor during most of his set. 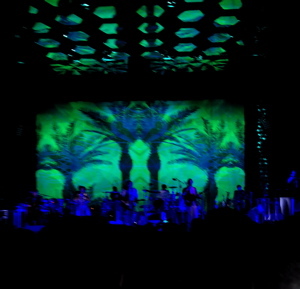 Arcade Fire took the stage to the sounds of a stripped down intro-version of My Body is a Cage from 2007’s Neon Bible. Lead singer Win Butler and the rest of the band gathered on the main stage in the dark, while Régine Chassagne, Butler’s wife, struck poses on the mini-stage in a head-to-toe mirrored costume. The spotlights lit her up like a human disco ball as the title track to Reflektor roared to life. The band’s music easily filled the arena space, with their anthemic songs reaching new heights. There are six core members to Arcade Fire, but on tour their size grows. Most of the evening there were 12-15 people on stage, constantly trading off instruments. Their exposure to life in Haiti, where the band has done considerable volunteer work, was most evident in the rich percussion section on stage, which partially is made up of drummers they brought along on tour from this island nation. Butler ran the show, with Chassagne dancing about as if channeling her inner-Cyndi Lauper, accenting songs with inflective vocals. She often stole the spotlight with moments of brilliance, which Butler welcomed. The open floor for this show became one big dance fest, as the crowd gravitated between the two stages, willingly accepting the invitation from the band to get involved by singing and clapping along. You could hear Canada in Butler’s vocals, at times reminiscent of Neil Young, with his cool, interpretive delivery. This was a smart, well-conceived show, from the atmospheric lighting, stage decor, sound, and inclusive ambiance. About half of the 20-song set was from their new disc, and all tracks were welcomed. Flashbulb Eyes and Joan of Arc translated perfectly to the larger arena setting. Tracks from their other discs, Funeral, Neon Bible and the Grammy winning 2010 Album of the Year, Suburbs, filled out the night. Particular standouts included Neighborhood #3 (Power Out), No Cars Go, Suburbs, It’s Never Over (Oh Orpheus), and Sprawl II (Mountains Beyond Mountains), featuring Chassagne on vocals, which is a showstopper. 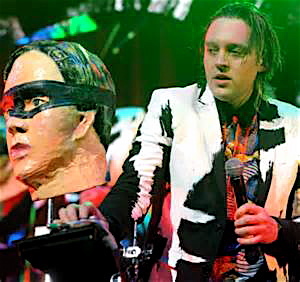 Guitarist and vocalist Win Butler with his alter-ego. For the encore, the band re-entered the arena on the remote stage, wearing all black and giant papier-mâché heads that resembled each band member’s likeness. They even played their instruments with these on. Slowly each member transitioned from the back of the arena to the main stage. The encore opened with a particularly spirited Normal Person, followed by Rebellion (Lies), from Funeral. Breaking up this last stretch was a cover of the Rolling Stones’ classic, The Last Time, done in true 1965 fashion. They quickly zoomed back into Arcade Fire mode with a celebratory Here Comes The Night Time, and the show concluded with the stunner, Wake Up. Even the usually stoic Butler couldn’t help but smile in satisfaction at the enthusiasm of the Louisville crowd, and commended the gathering for making the night a hoot for all involved.